Can Facebook's Open Compute Stand Up To Amazon Web Services? Can Facebook’s Open Compute Stand Up To Amazon Web Services? Facebook servers are probably unlike anything any other organization in the world has every had to deal with. The social networking site has endless racks of servers that spreading forever through massive warehouses. All of which helps Facebook keep up with the nearly 50,000 new users that join the social networking site each and every day, culminating into the user base that exceeds 600 million users worldwide. However, Facebook is always looking for ways to improve their server efficiency, both for the environment and for their bottom line. And that’s where Open Compute comes in to play. Open Compute is a program launched by Facebook that allows large scale data server and storage services to enter into the world of Facebook servers and poke around, and ultimately make recommendations for how things can be improved. 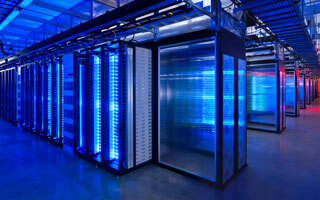 But the Open Compute program also encourages other companies to take part in the Facebook infrastructure within the servers, and utilize the massive capacity for their server needs. Now to me, when you open up server environment to other enterprise clients to use, you are now talking offer cloud based web services. And this sounds like Facebook may be getting ready to enter another frontier of their business model, and that being cloud server solutions. With Facebook’s massive storage capacity, and collaborative work from other large scale server providers to make Facebook’s servers more efficient, it really sounds like the logical next step. This would, of course, be competing directly with Amazon and the AWS (Amazon Web Services) platform. This is Amazon’s cloud storage and server solution for enterprise clients. Will Facebook become a competitor in the cloud web services market?